" Round Mellbreak with Peter "
Date & start time: Friday 7th July 2017, 5 pm. 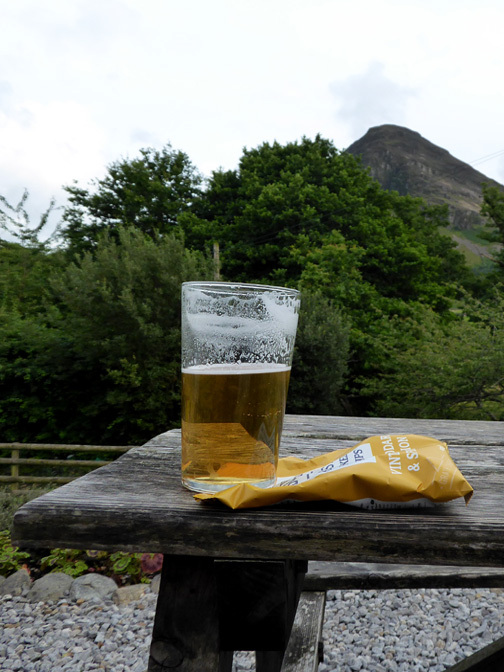 Places visited : Crummock Water, Ling Crags, Mosedale Valley and the Kirkstile Inn. 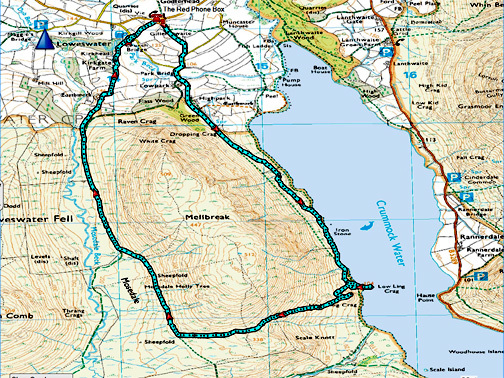 Walk details : 5.9 miles, 850 feet of ascent, about 2.5 hours including refreshments. 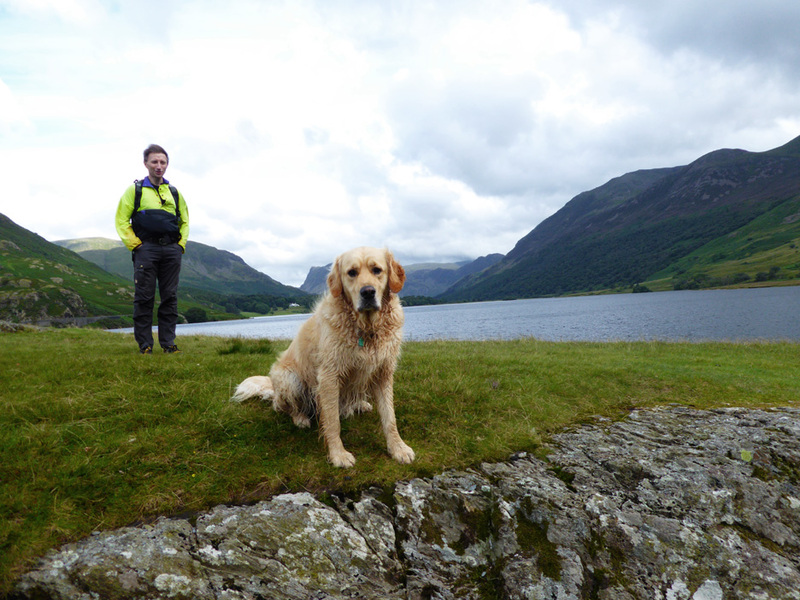 Walked with : Peter and our dog Dylan. 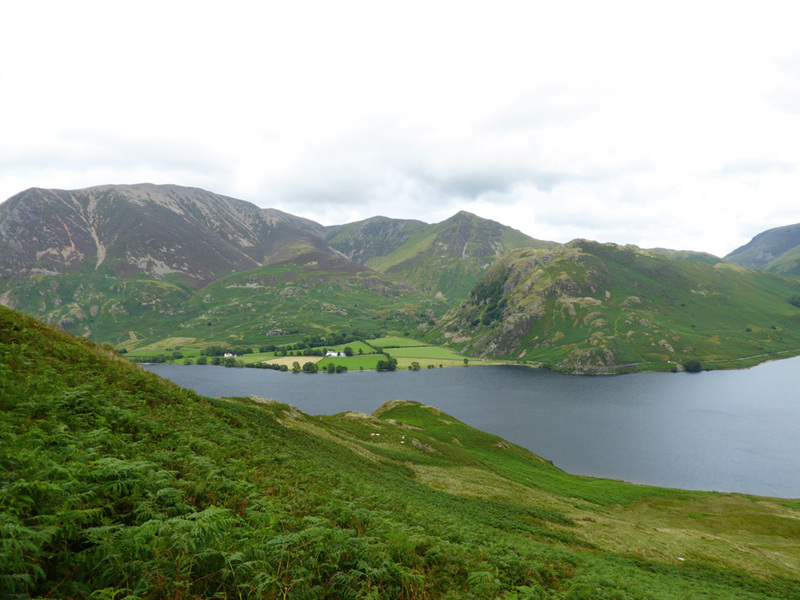 Highest Point : Close to Scale Knott, 1135 feet - 350 metres. 0mWeather : A warm day with sunny intervals and a warm breeze. Peter Burgess has come over to stay for a few days. 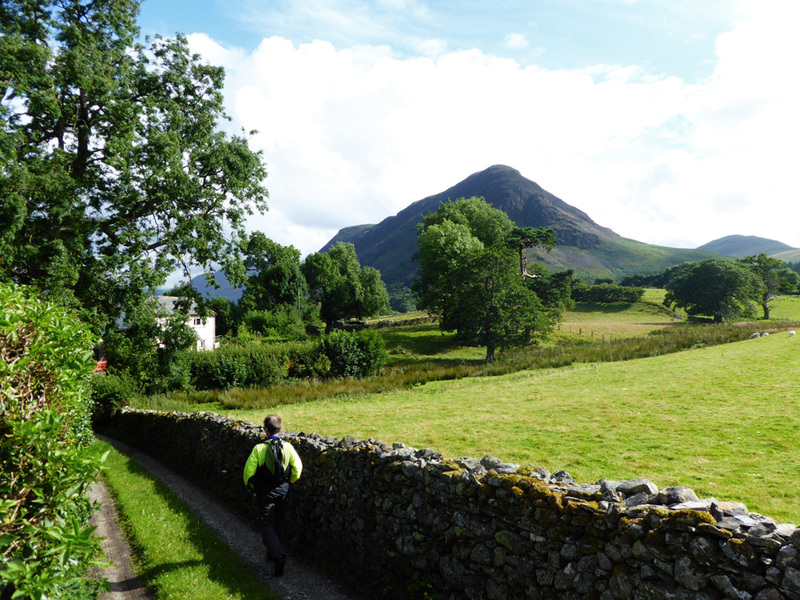 and we returned via the Loweswater lakeside road. 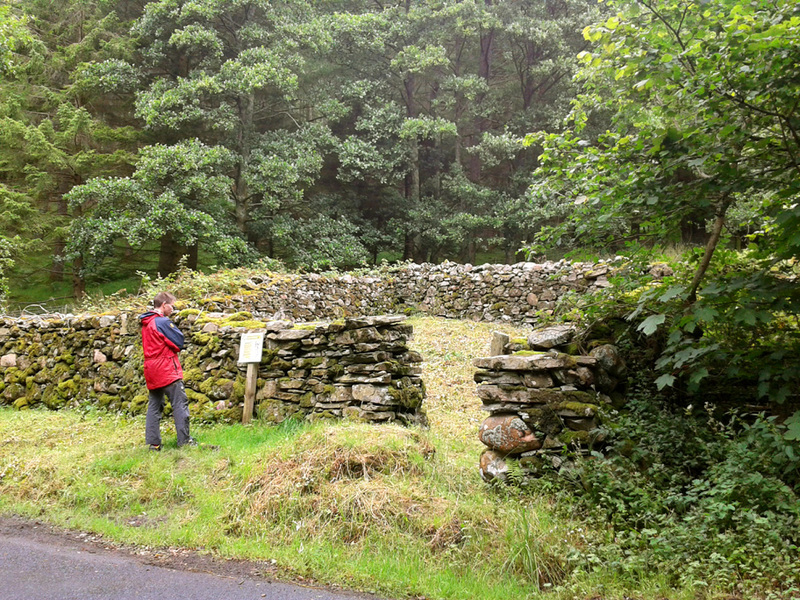 With keen interest in geography and local history Peter spots an old walled enclosure, recently cleared of undergrowth. 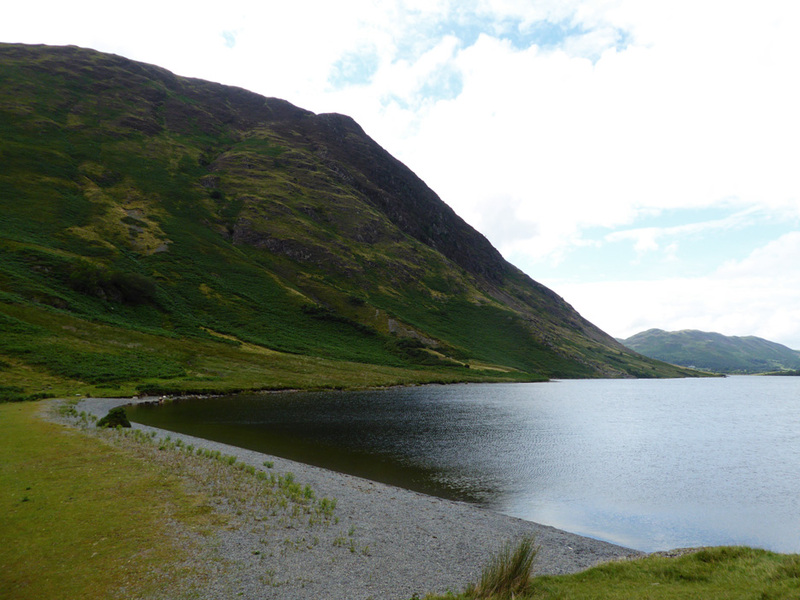 It stands next to the road that runs along the side of Loweswater lake. 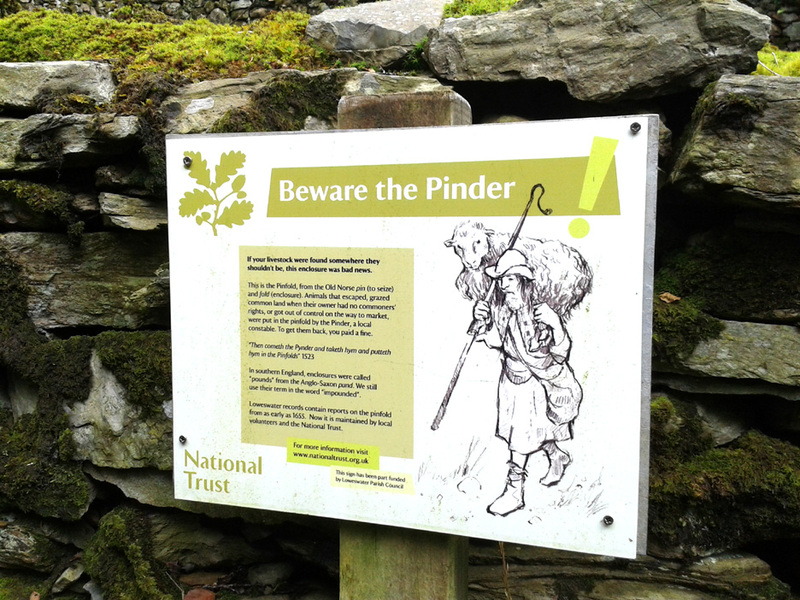 It's an old Pinfold or Pound where lost animals were held in the old days. Hold your cursor over the picture to read the detail a little larger. That evening we enjoyed a short stroll in the evening up to Harry's Pool. 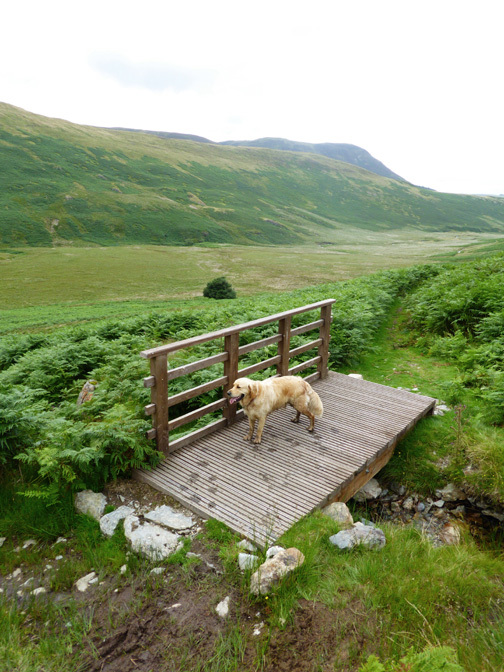 The river's in partial spate and walkers to Hen Comb might appreciate a small footbridge. 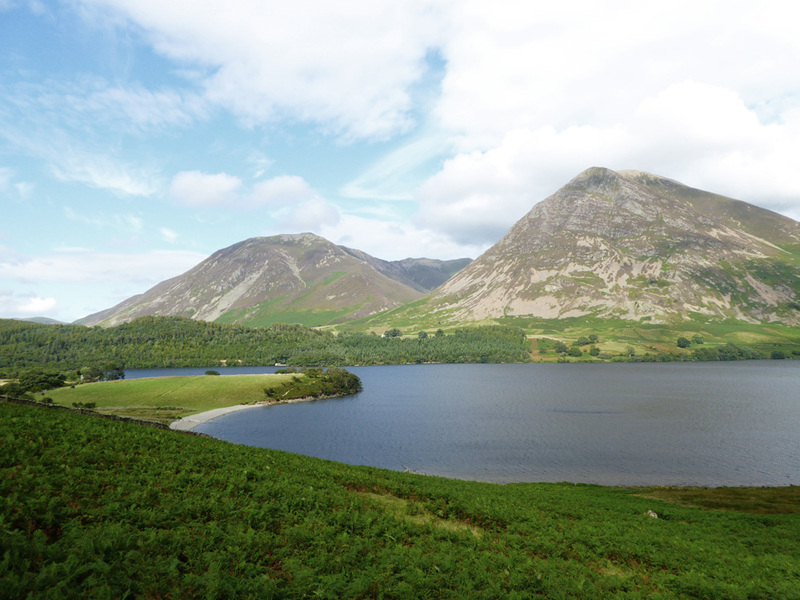 Next day, Peter and I venture out along the shores of Crummock towards Ling Crags. 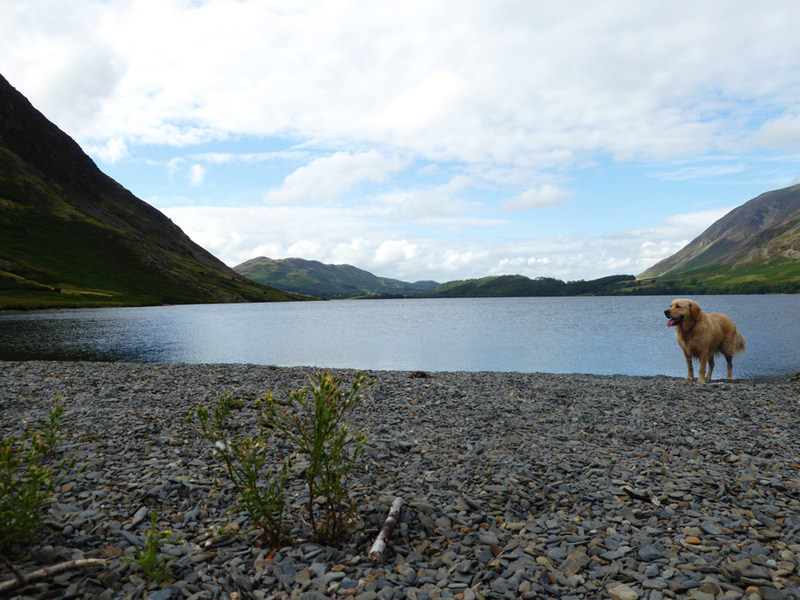 Chance for Dylan to stretch his legs too as Harry eases back and takes a shorter but separate walk with Ann. 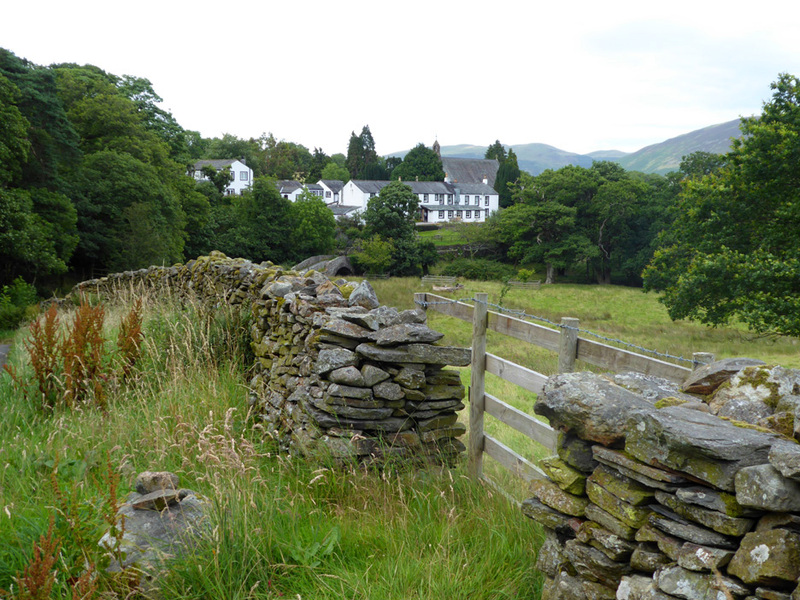 The walk started from home as we walked down the side lane to Gillerthwaite. 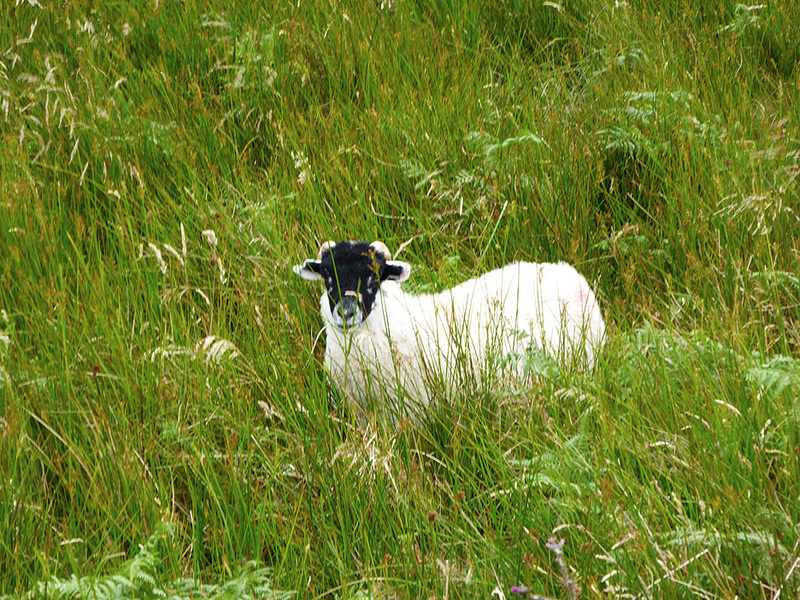 We cross the meadows where the farmer is holding back on haymaking, hoping the meadow flowers will soon bloom. 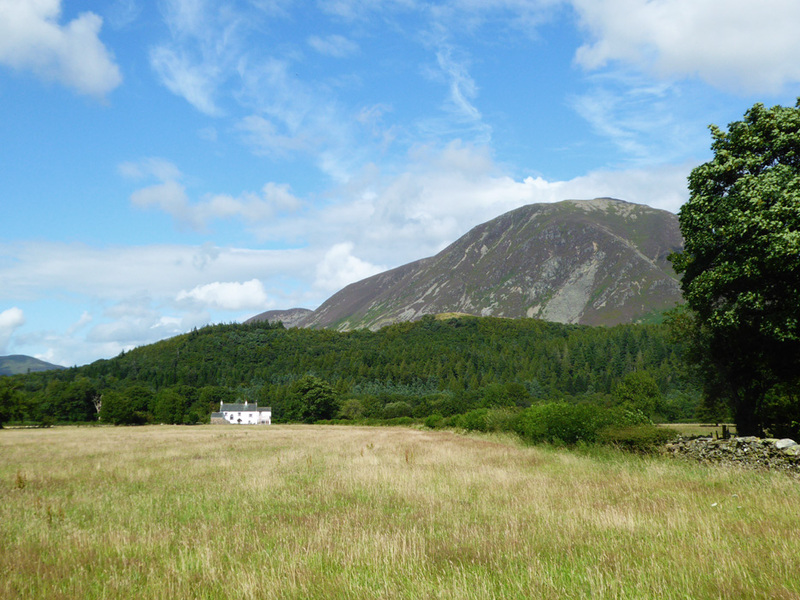 Across the field is Muncaster House with Whiteside behind. 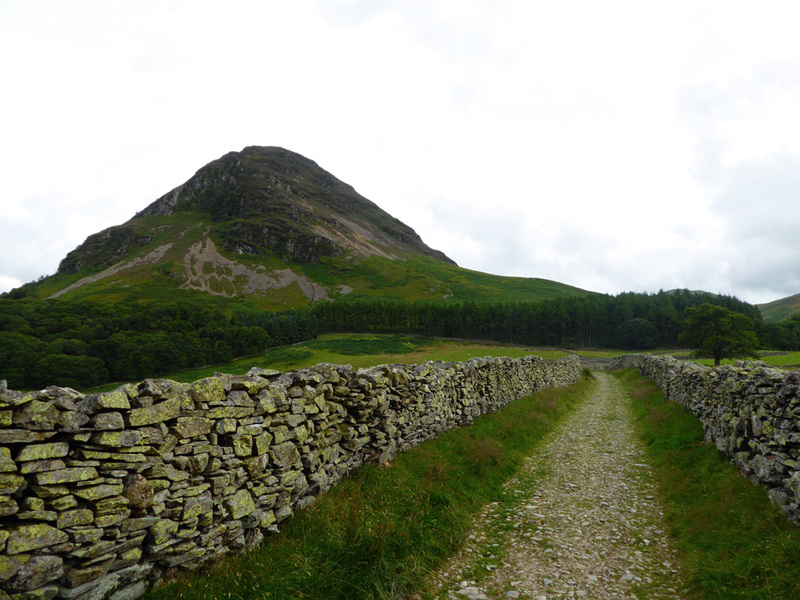 Out onto the lower road over the stile, heading for High and Low Park. The sunshine has returned in force after yesterday's overcast and damp day. Low Park House with its lovely red door. 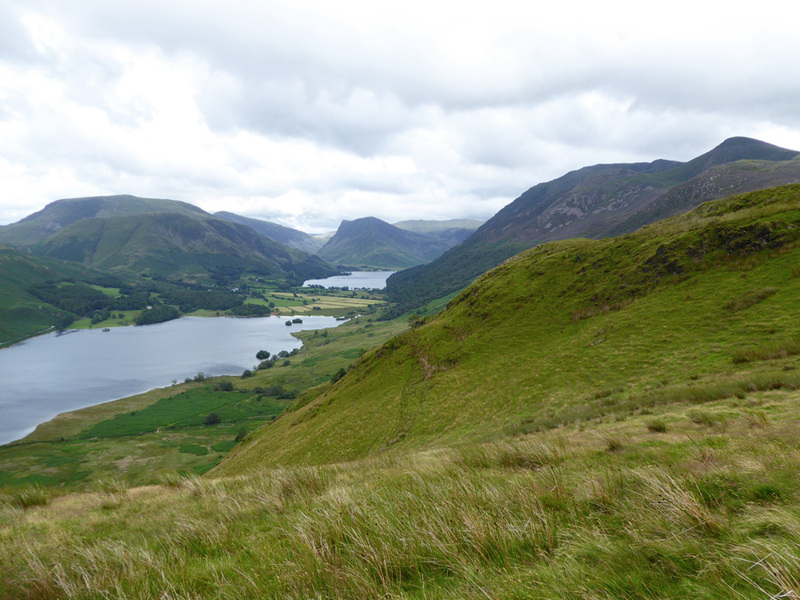 From the high ground above High Park we get a view of Rannerdale Knotts this afternoon. Looking down on the beach next to The Peel. 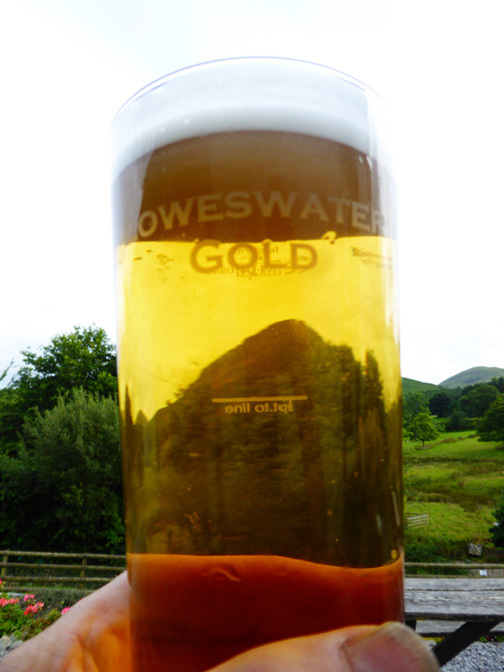 Across the way, the view of Whiteside now includes Hopegill Head and Grasmoor. 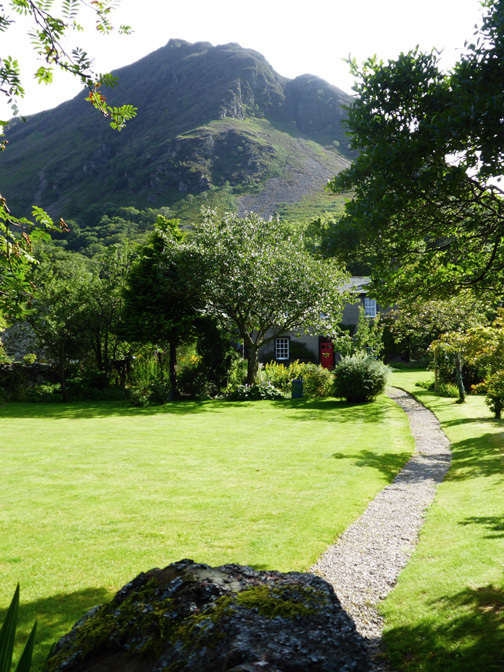 The landmark (or should we say watermark) Iron Stone as we walk along the lakeside path. It has a gull perched on it today rather than a cormorant. 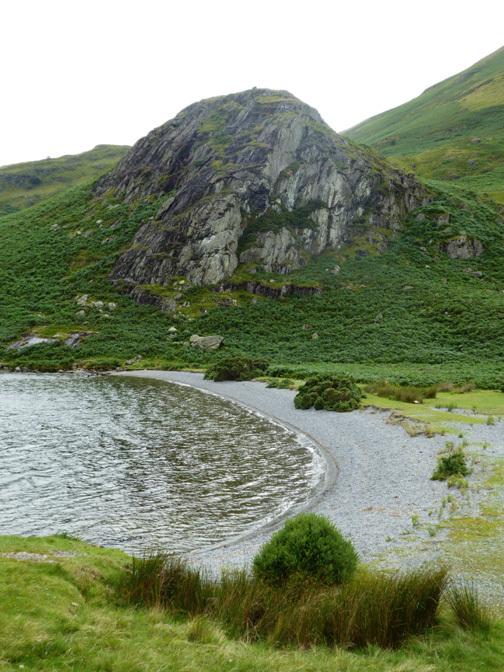 The beach on Low Ling Crag . . . a pebble-eye view. 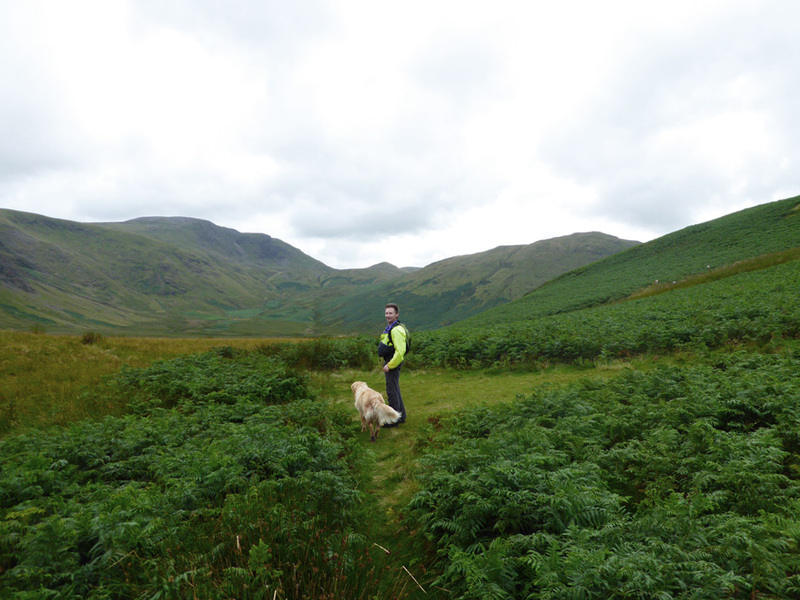 Slightly taller with Dylan in view and Low Fell now clear in the background. Dylan looking serious . . . on the grassy knoll on top of the crag. Decision time . . . which way do we go now ? 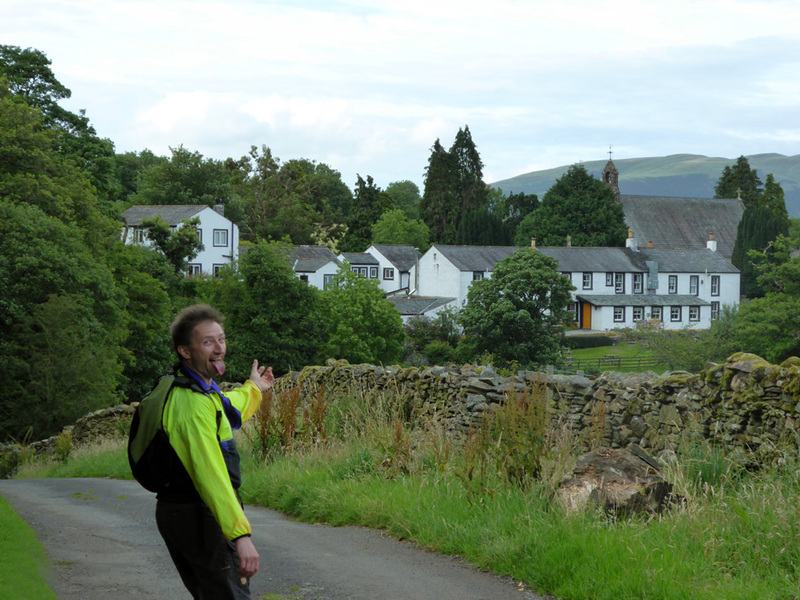 and around the back of the fell ? The second option it was then . 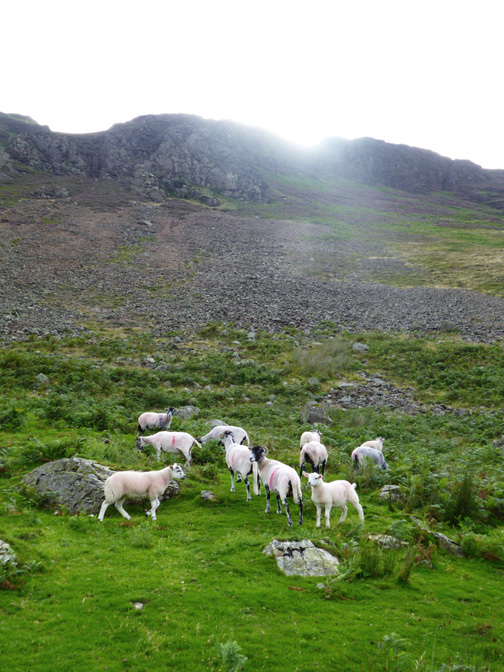 . . as we take the steep path up the right hand side of the crag. 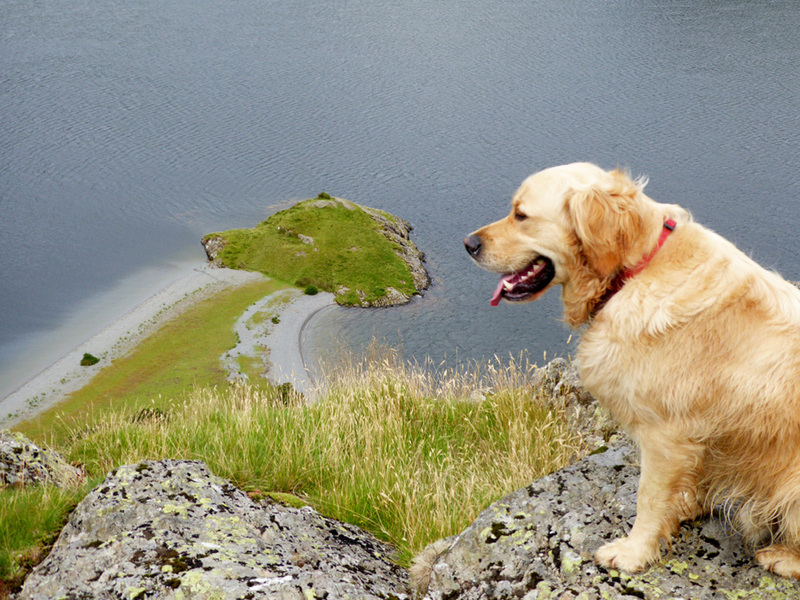 we find ourselves on the top of High Ling Crag. How many of you noticed the two dogs heads ? Hold your cursor over the picture to make one of them nod ! 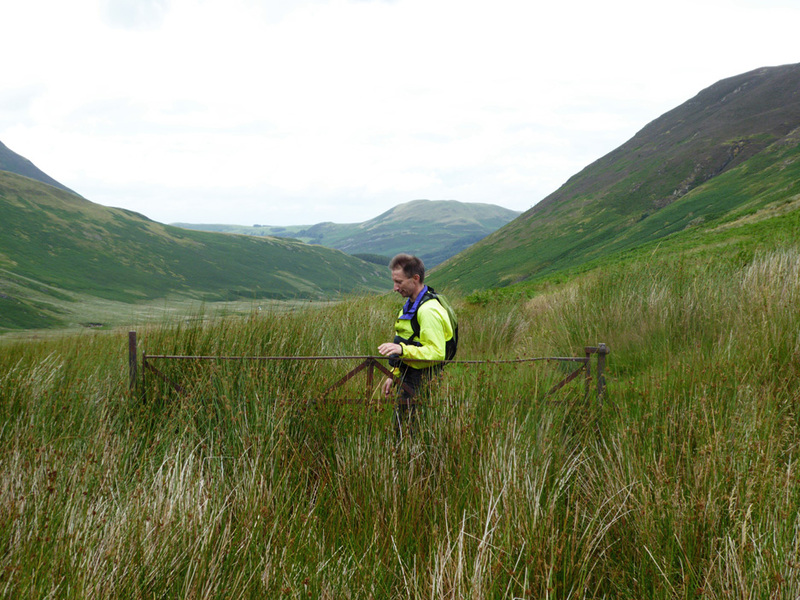 climbing up from the 150m contour to the 350m contour in a ridiculously short space of time. 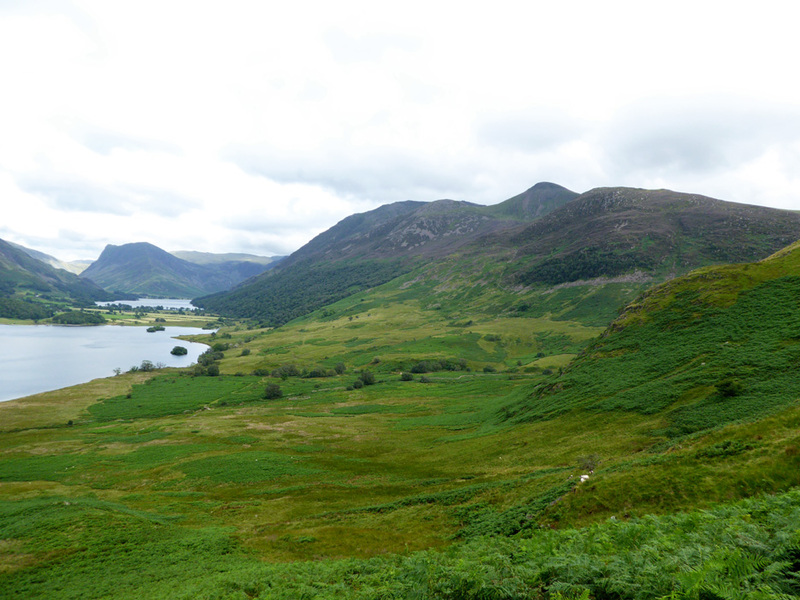 looking across at distant Buttermere and the surrounding fells clad in their summer green. 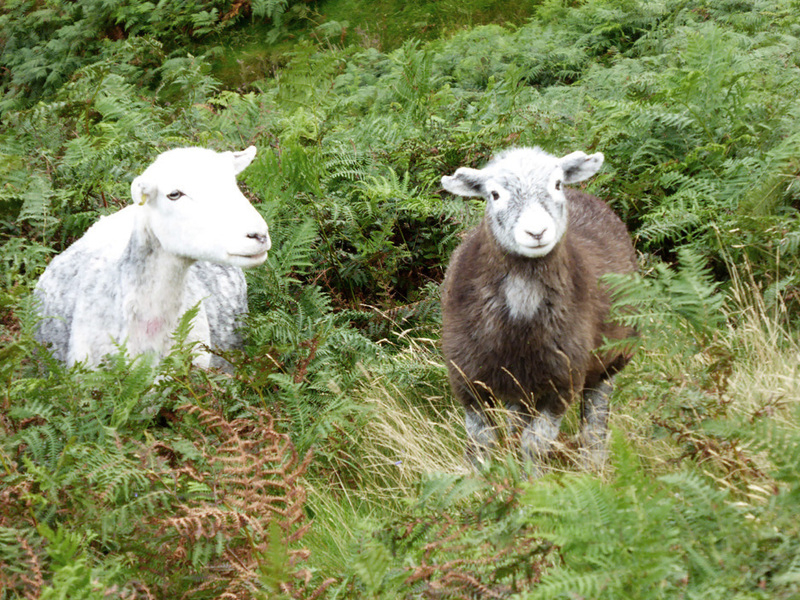 The local ladies displaying their summer coats. 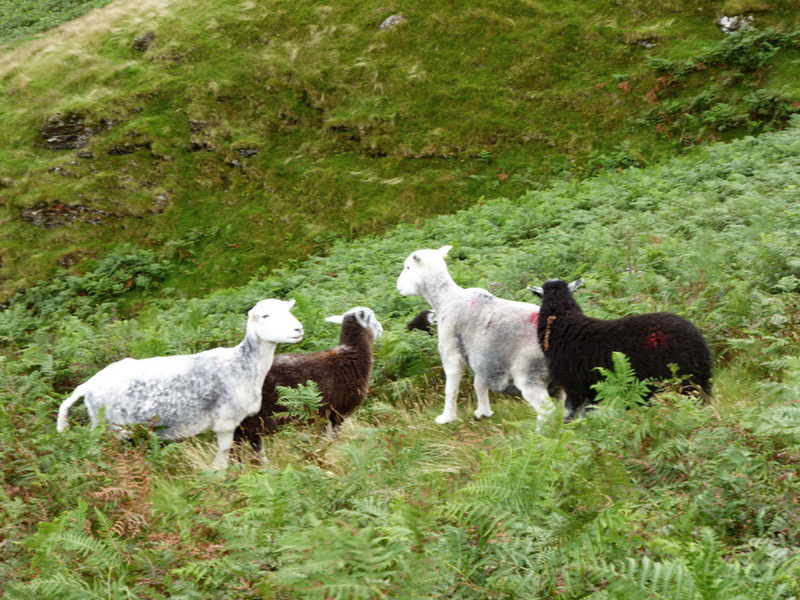 The youngsters still have the pure Herdwick, dark brown woolly fleece. They are a bit like humans . . . their hair starts brown and goes grey with age ! The youngsters also develop lovely white rings around their eyes like sunglasses ! 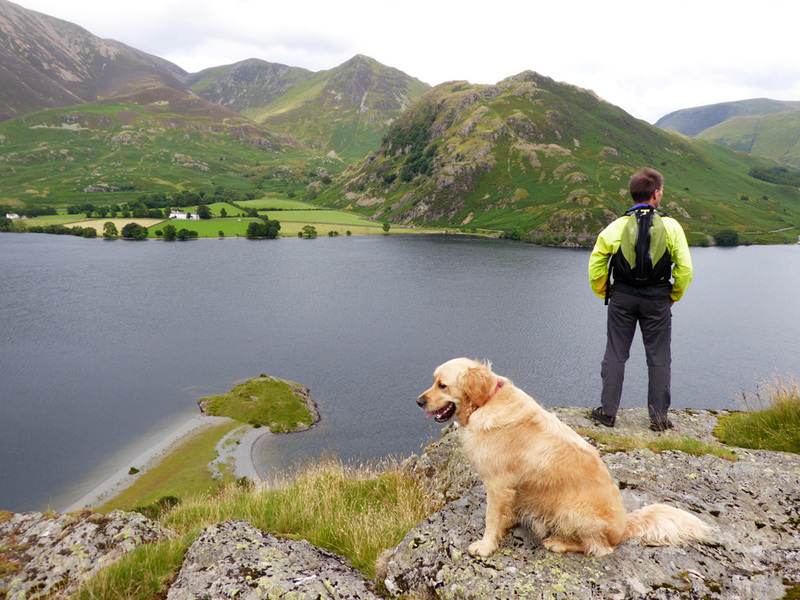 A break in the slope as we reach the dizzy heights near Scale Knott. It was a steep ascent but no more actual climbing had we taken the longer path by Scale Force. 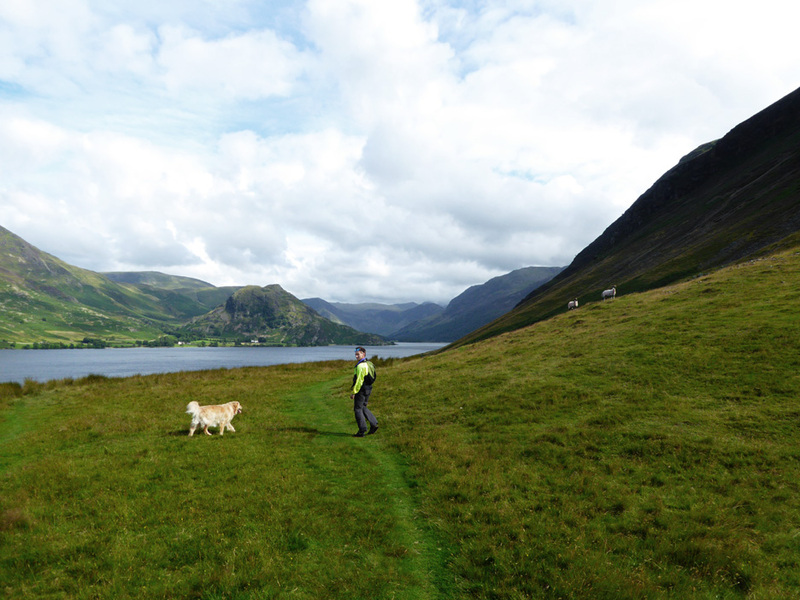 Entering the wild open spaces of Mosedale . . . not a lot of other folk about. 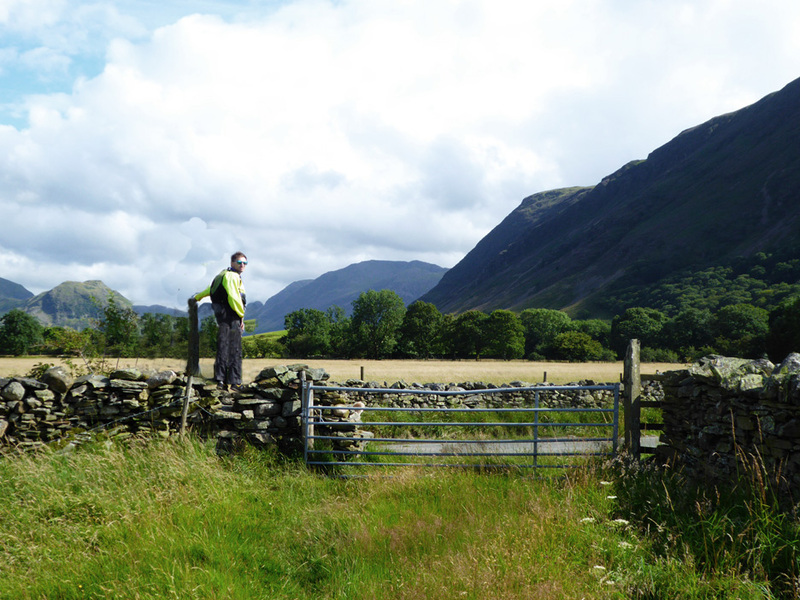 The distant skyline consists of Great Borne, Floutern Cop and Hen Comb.
. . . not angry that is, but one with a white coat and the classic herdwick sunglasses. Last one down the valley . . . please shut the gate. 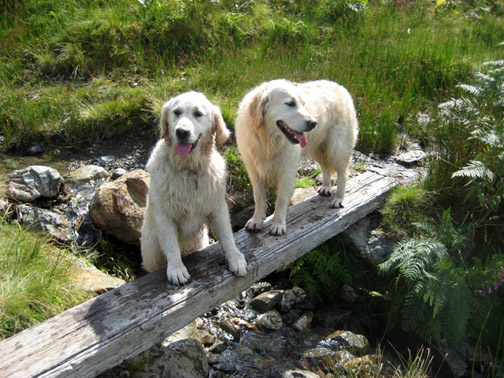 There's a new bridge been built since we were last up here. 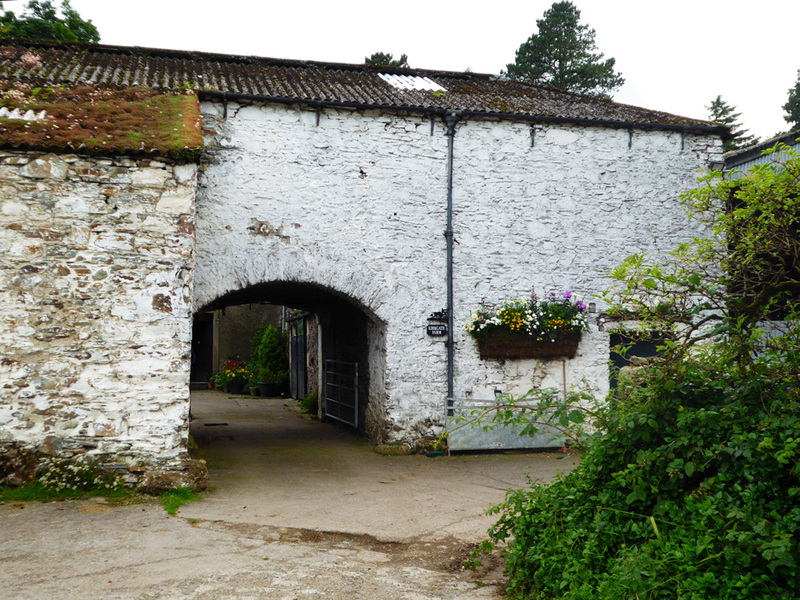 The photo to the left is as it is now. with Harry and Bethan walking the plank. 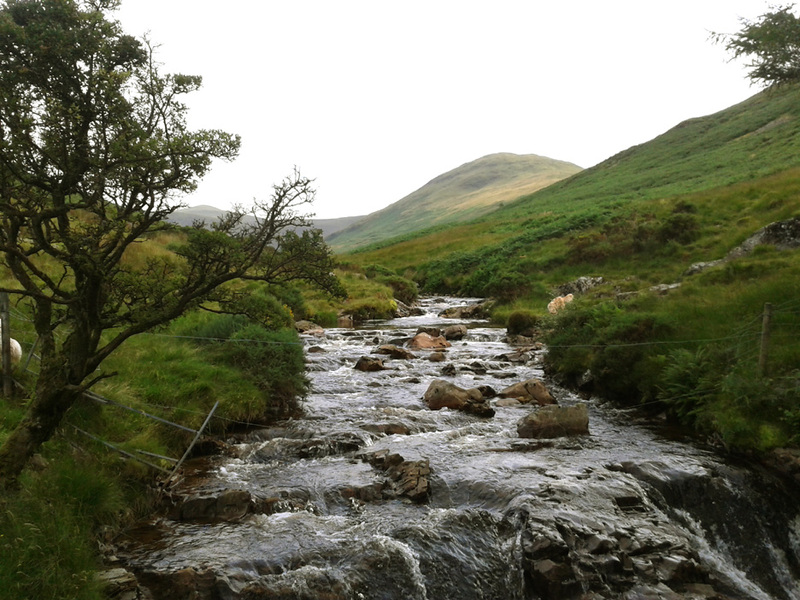 it's just that I haven't a more recent picture of the old stream crossing. 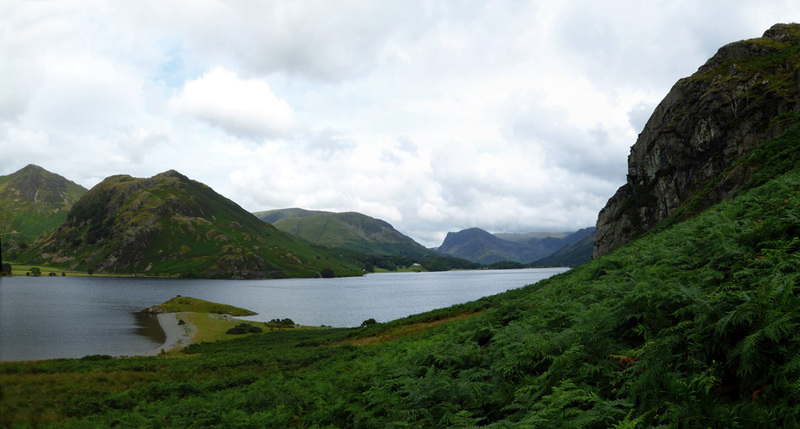 Leaving Mosedale Valley now and looking back at Mellbreak . . . successfully circumnavigated today. Well almost circumnavigated (as we started from the phone box). 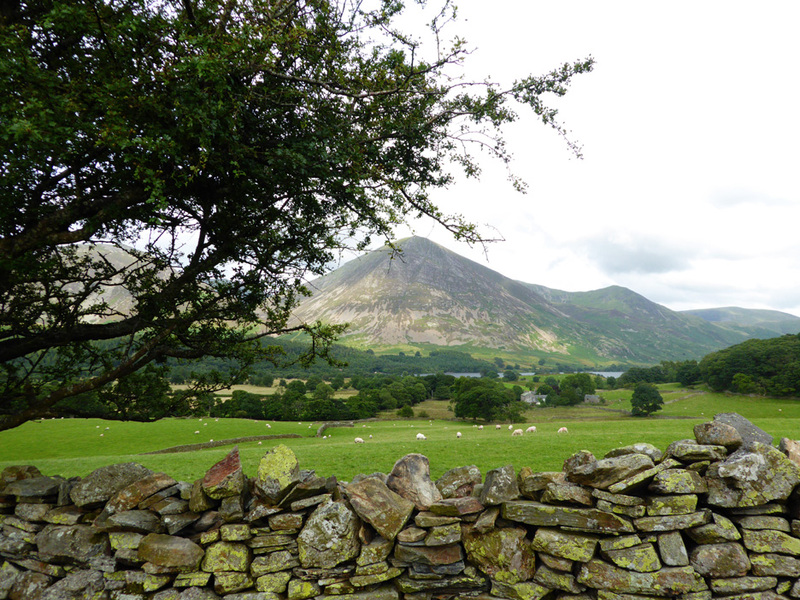 Here we look down from the lane to Low Park, Crummock Water and distant Grasmoor once again. but to be fair they've been mounted on the wall, well above rabbit height. 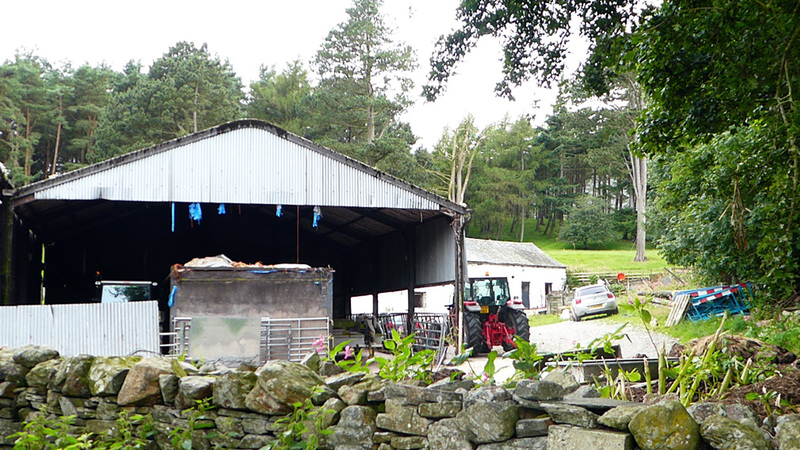 The cattle barns are empty at this time of year. We passed the animals out in the fields next to the lane on the way down. Ahead is the Kirkstile pub . . .
Alongside me . . . a rather thirsty Peter. 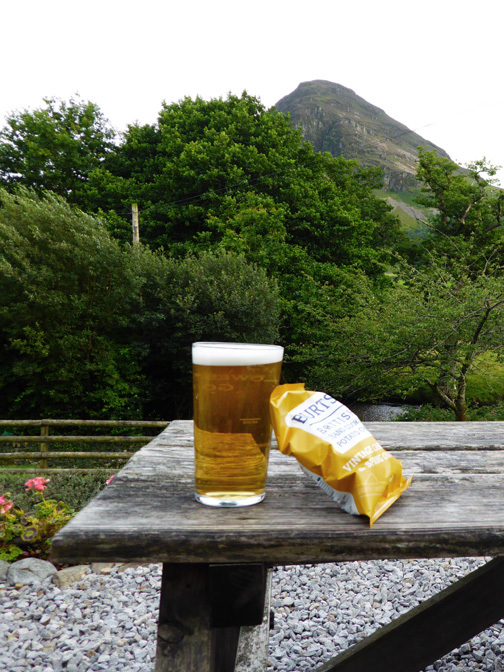 The crisp packet is placed underneath due to the strong breeze.
. . . just hold it up to the light in the right place ! 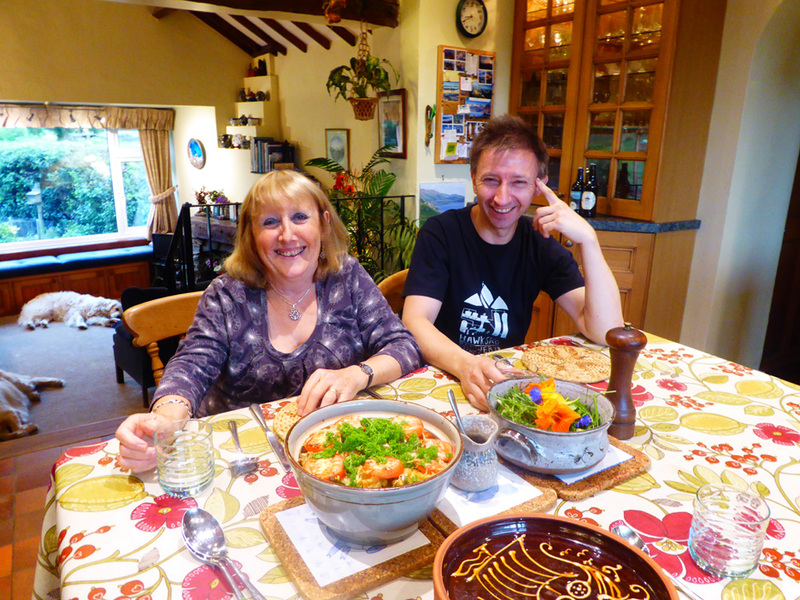 In the evening Ann had cooked a lovely meal. 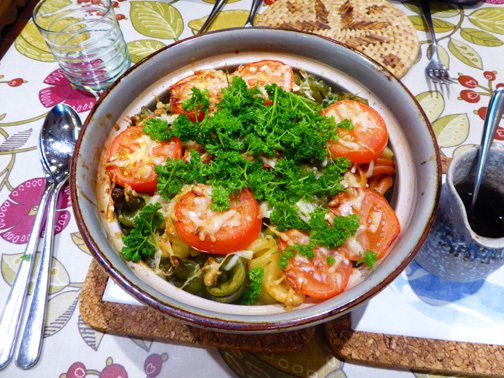 A simple pasta, spinach and cheese bake with parsley topping . . .
. . . plus a garden salad with edible cornflower and nasturtium flowers. 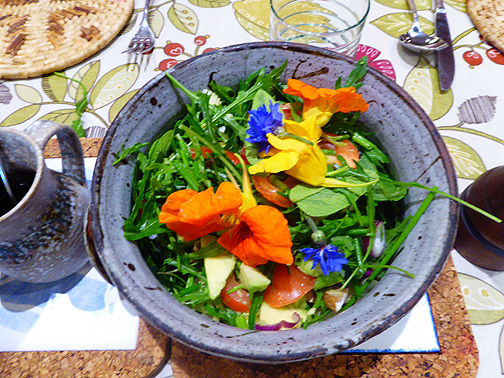 The garden has provided some lovely meals despite the wildlife trying to eat eat as many of the young plants as possible ! Technical note: Pictures taken with Ann's Panasonic Lumix TZ60, (or the first few on my Samsung mobile). This site best viewed with . 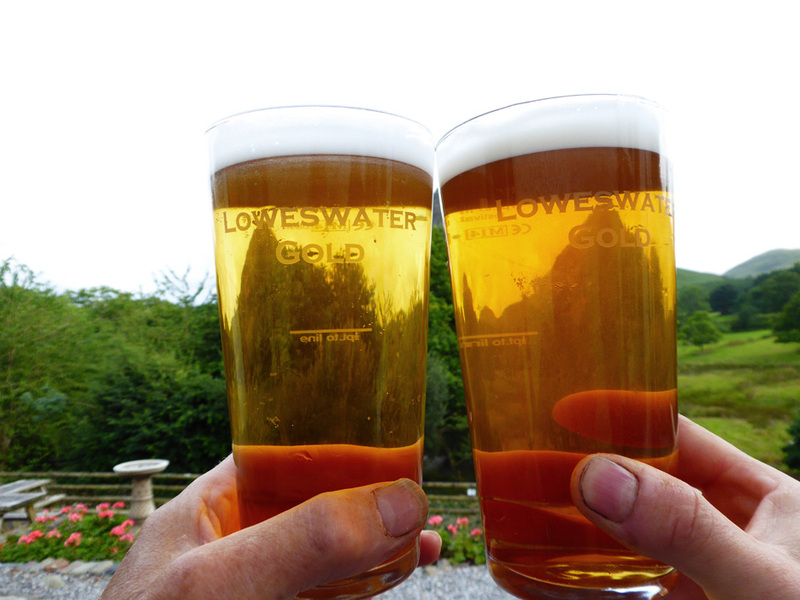 . . two pints of re-hydration please.